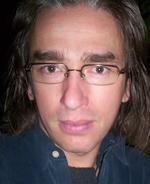 Kevan Manwaring is a writer, teacher and storyteller who lives in Bath. Holder of an MA in the Teaching and Practice in Creative Writing from Cardiff University, he teaches creative writing for the Open University. He also runs freelance courses in storytelling and various aspects of the writing process to a wide variety of students. As a professional storyteller he has appeared in numerous shows both solo and with Fire Springs, both in Britain and abroad (USA, Italy and Malta). He is the author of The Bardic Handbook, Lost Islands, The Long Woman and others. His poems and articles have appeared in several magazines and anthologies. In 1998 he won the Bardic Chair in his adopted city of Bath. He runs the small press Awen Publication.